Largest independent building materials supplier in New England, plus in-house design and engineering services! USG’s Sheetrock UltraLight Panels are the lightest ½-inch gypsum wallboard panels available (1.2 to 1.4 lbs./sf), up to 30 percent lighter than traditional gypsum wallboard panels. 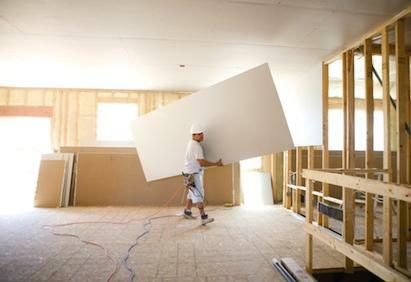 One HousingZone.com editor pointed out that one of the greatest benefits to these lighter drywall panels means less fatigue for installation crews, which can result in improved productivity. Learn more about USG and other drywall products on the National Lumber Drywall Division home page! Thanks to HousingZone.com for their review of the Sheetrock UltraLight Panels!